Formosa 51 – Built in 1979. 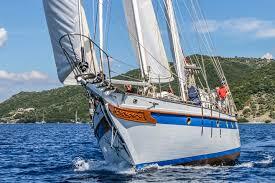 Popular go-anywhere classic owner’s version cruising yacht; the choice for live-a-boards and extended cruisers. 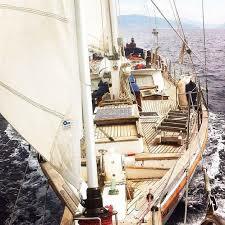 Bought with the intention of sailing around the world, our circumstances have changed and the offer of our dream job means we will be land based for the forseeable future. We first considered keeping her, but she needs an owner with the time to look after her properly and sail her. Perkins-brand 115hp 6 cylinder diesel (totally rebuilt 2015, including new pistons and liners, new exhaust manifold, new exhaust mixing elbow, refurbished crankshaft, refurbished oil cooler, refurbished fuel pump,) driving 3 bladed prop through Borg Warner Gearbox. Onan-brand 240 volt generator, comprehensive navigation equipment, full safety inventory, inflatable rowing dinghy, teak decks new in 1998, rigging new and masts serviced in 2011, new chainplates 2015, new bespoke bimini 2015, new bathing platform 2015, rigging check 2015, solar and wind generators 2015. Fitted out for blue water cruising 2015 prior to our Atlantic crossing. She comfortably sleeps 6/8 in 3 cabins. All the way aft is the owner’s stateroom with its own private head. Next forward is the large saloon with seating for eight around the marble table. A steering station is in the saloon. 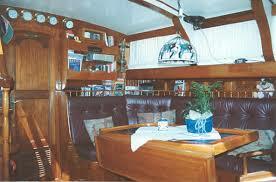 Going forward down three steps to a central passage way one finds the galley to starboard and the port cabin to port. The port cabin comprises one double bunk and one single bunk, ample hanging storage and 3 drawers. Next forward is the starboard cabin. Again comprising one double bunk and one single, hanging locker and drawers. Lots of storage under the bunk. Through the starboard cabin is the forepeak. This houses the generator and sails, tools etc. Between the starboard cabin and the port cabin is the forward head. Both heads have showers. aft, two in the two bunks in the port cabin, and two in the two bunks in the starboard cabin. At a push 3 can sleep in the guest cabins. Two more could bed down if the saloon table were converted to a double bed. This well-maintained 'Formosa 51' ketch has ample accommodations for six to 10 people but can be sailed comfortably by a crew of two. Her gleaming white hull is complemented by traditional teak decking. 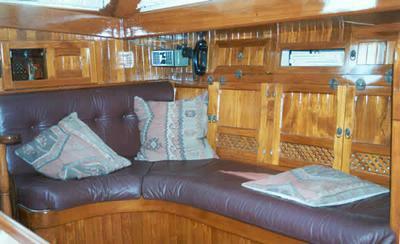 Below decks the teak woodwork and paneling, with leather button upholstery,and Tiffany lamp, provide up-classic comfort. She provides fun sailing in classic surroundings. Our intention was to complete some minor cosmetic work (one saloon cushion needs reupholstering, we have the leather patches, and some ply needed in master cabin) and to put her on the market for US$175,000 $160,000 but we don’t have the time. The cosmetic work needed will cost a maximum of US$2000 so she is priced for a quick sale! She is documented and registered in the UK and is considered to be VAT paid because of her age. Currently laying in Grenada in the West Indies. A 2014 Purchaser's Survey is available for inspection. Wow ... would really like to hear the combination that gives you 1K on 211 gal with this engine! Please share the prop and other specs that yields this performance if you can. What RPM and approx cruising speed are we talking about? Even sister ships are different, especially their engines. Not forgetting the prop... We average just a bit over 1 US gallon an hour at cruising speed. You're showing a 211 gal fuel tank and saying 1,000 NM range with a 115 Perkins ... kinda impossible. BTW I own a sister ship.